By January 1971, the Prime Minister of Uganda, Milton Obote was prepared to rid himself of the potential threat posed by Amin. Departing for the Commonwealth Conference of Heads of Government at Singapore, he relayed orders to loyal Langi officers that Amin and his supporters in the army were to be arrested. Various versions emerged of the way this news was leaked to Amin; in any case, Amin decided to strike first. In the early morning hours of January 25, 1971, mechanized units loyal to him attacked strategic targets in Kampala and the airport at Entebbe, where the first shell fired by a pro-Amin tank commander killed two Roman Catholic priests in the airport waiting room. 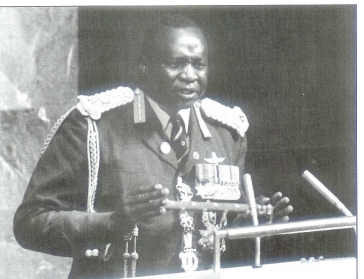 Amin's troops easily overcame the disorganized opposition to the coup, and Amin almost immediately initiated mass executions of Acholi and Langi troops, whom he believed to be pro-Obote. Amin's military experience, which was virtually his only experience, determined the character of his rule. He renamed Government House "the Command Post," instituted an advisory defense council composed of military commanders, placed military tribunals above the system of civil law, appointed soldiers to top government posts and parastatal agencies, and even informed the newly inducted civilian cabinet ministers that they would be subject to military discipline. Uganda was, in effect, governed from a collection of military barracks scattered across the country, where battalion commanders, acting like local warlords, represented the coercive arm of the government. The GSU was disbanded and replaced by the State Research Bureau. SRB headquarters at Nakasero became the scene of torture and grisly executions over the next several years. Despite its outward display of a military chain of command, Amin's government was arguably more riddled with rivalries, regional divisions, and ethnic politics than the Uganda People's Congress (UPC) coalition that it had replaced. The army itself was an arena of lethal competition, in which losers were usually eliminated. Within the officer corps, those trained in Britain opposed those trained in Israel, and both stood against the untrained, who soon eliminated many of the army's most experienced officers. In 1966, well before the Amin era, northerners in the army had assaulted and harassed soldiers from the south. In 1971 and 1972, the Lugbara and Kakwa (Amin's ethnic group) from the West Nile were slaughtering northern Acholi and Langi, who were identified with Obote. Then the Kakwa fought the Lugbara. Amin came to rely on Nubians and on former Anya Nya rebels from southern Sudan. In September 1972, Amin expelled almost all of Uganda's 50,000 Asians and seized their property. Although Amin proclaimed that the "common man" was the beneficiary of this drastic act-- which proved immensely popular--it was actually the army that emerged with the houses, cars, and businesses of the departing Asian minority. This expropriation of property proved disastrous for the already declining economy. Businesses were run into the ground, cement factories at Tororo and Fort Portal collapsed from lack of maintenance, and sugar production literally ground to a halt, as un-maintained machinery jammed permanently. Uganda's export crops were sold by government officials, but most of the foreign currency they earned went for purchasing imports for the army. Another near-obsession for Amin was the threat of a counterattack by former president Obote. Shortly after the expulsion of Asians in 1972, Obote did launch such an attempt across the Tanzanian border into south western Uganda. His small army contingent in twenty-seven trucks set out to capture the southern Ugandan military post at Masaka but instead settled down to await a general uprising against Amin, which did not occur. A planned seizure of the airport at Entebbe by soldiers in an allegedly hijacked East African Airways passenger aircraft was aborted when Obote's pilot blew out the aircraft's tires and it remained in Tanzania. Amin was able to mobilize his more reliable Malire Mechanical Regiment and expel the invaders. Although jubilant at his success, Amin realized that Obote, with Nyerere's aid, might try again. He had the State Research Bureau (SRB) and the newly formed Public Safety Unit (PSU) redouble their efforts to uncover subversives and other imagined enemies of the state. General fear and insecurity became a way of life for the populace, as thousands of people disappeared. In an ominous twist, people sometimes learned by listening to the radio that they were "about to disappear." State terrorism was evidenced in a series of spectacular incidents; for example, High Court Judge Benedicto Kiwanuka, former head of government and leader of the banned DP, was seized directly from his courtroom. Like many other victims, he was forced to remove his shoes and then bundled into the trunk of a car, never to be seen alive again. Whether calculated or not, the symbolism of a pair of shoes by the roadside to mark the passing of a human life was a bizarre yet piercing form of state terrorism. Amin did attempt to establish ties with an international terrorist group in July 1976, when he offered the Palestinian hijackers of an Air France flight from Tel Aviv a protected base at the old airport at Entebbe, from which to press their demands in exchange for the release of Israeli hostages. The dramatic rescue of the hostages by Israeli commandos was a severe blow to Amin. Amin's government, conducted by often erratic personal proclamation, continued on. Because he was illiterate--a disability shared with most of his higher ranking officers--Amin relayed orders and policy decisions orally by telephone, over the radio, and in long rambling speeches to which civil servants learned to pay close attention. The bureaucracy became paralyzed as government administrators feared to make what might prove to be a wrong decision. The minister of defense demanded and was given the Ministry of Education office building, but then the decision was reversed. Important education files were lost during their transfer back and forth by wheelbarrow. In many respects, Amin's government in the 1970s resembled the governments of nineteenth-century African monarchs, with the same problems of enforcing orders at a distance, controlling rival factions at court, and rewarding loyal followers with plunder. However, Amin's regime was possibly less efficient than those of the pre-colonial monarchs. By 1978 Amin's circle of close associates had shrunk significantly--the result of defections and executions. It was increasingly risky to be too close to Amin, as his vice president and formerly trusted associate, General Mustafa Adrisi, discovered. When Adrisi was injured in a suspicious auto accident, troops loyal to him became restive. The once reliable Malire Mechanized Regiment mutinied, as did other units. In October 1978, Amin sent troops still loyal to him against the mutineers, some of whom fled across the Tanzanian border. Amin then claimed that Tanzanian President Nyerere, his perennial enemy, had been at the root of his troubles. Amin accused Nyerere of waging war against Uganda, and, hoping to divert attention from his internal troubles and rally Uganda against the foreign adversary, Amin invaded Tanzanian territory and formally annexed a section across the Kagera River boundary on November 1, 1978. Nyerere mobilized his citizen army reserves and counterattacked, joined by Ugandan exiles united as the Uganda National Liberation Army (UNLA). The Ugandan Army retreated steadily, expending much of its energy by looting along the way. Libya's Qadhafi sent 3,000 troops to aid fellow Muslim Amin, but the Libyans soon found themselves on the front line, while behind them Ugandan Army units were using supply trucks to carry their newly plundered wealth in the opposite direction. Tanzania and the UNLA took Kampala in April 1979, and Amin fled by air, first to Libya and later to a seemingly permanent exile in Saudi Arabia. The war that had cost Tanzania an estimated US$1 million per day was over. What kind of government would attempt the monumental task of rebuilding the economically and psychologically devastated country, which had lost an estimated 300,000 victims to Amin's murderous eight-year regime?